Pricing your product or service is a difficult process that can involve multiple points of influence – cost, existing market, competitors, etc. But people frequently overlook or perhaps misunderstand the role that value plays in actually achieving any price ultimately set. Let’s look at both sides of any sale as most people normally see this process – product, service, or even an auction; it doesn’t matter, the principle that is usually taught is the same. Any business, any seller, sets a minimum price based on its costs. Anything below this price will result in a loss; anything above this price is their “incentive to sell”. The higher the price, the stronger the incentive to sell. But it doesn’t matter how strong your incentive to sell is if you do not attract any buyers. Every buyer has a maximum price in their mind. This is set based on their own expectations, their budgets, perhaps anchoring from competitors etc. Anything below this maximum price is their incentive to buy – they feel like they are getting a good deal. The lower the price compared with their mental maximum price, the stronger the incentive to buy. This might be true in a commodity industry where there is no differentiation and everything is based on price alone, but this is not the case for most of us. Even in commodity industries, there are times when people will pay a slightly higher price because of location or perhaps because they like the people at the supplier. And so the better way to think about pricing when looking at the buyer’s side of the equation is with “value”. The incentive to buy increases or decreases based on the perceived value that a customer receives from your product or service. 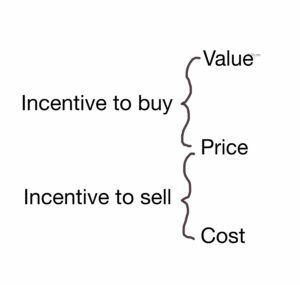 If that perceived value is below your price, then there is no incentive to buy; and the more value you can deliver, the stronger the incentive to buy. This is where you marketing team needs to provide a clear strategy, strong differentiators, relevant benefits, and to target customers with a strong need to ensure that the incentive to buy is clear and the path to a sale is smooth. It is also important that your sales team (should you use one) is also providing an incentive to buy when involved with a customer. If a salesperson is losing deals based on price, then perhaps they are not nurturing the prospects using value and are not building a strong incentive to buy during their interactions. If your business is an on-going service or a product with a subscription model, then you should also be aware that value is something that does not end once the sale has been made. Value can erode over time for no other reason that complacency or familiarity. Your service providers, practitioners, and product managers need to think about your customers incentive to buy and ensure that they have a strong incentive to continue to buy regularly. It’s important to understand your minimum price and to build services or sell products that provide you with an “incentive to sell”; but you also need to consider your customer’s “incentive to buy” if you want to break out from being a commodity business. Review your marketing; your sales processes and the way that you work with customers over time to ensure that you are always communicating and delivering perceived value.